Table games have grown in their fame since their inventions, and every day more versions continue to impress. Ride’m poker is such, and it is about the traditional game of poker. It, however, has additional extras which make it a bit more interesting. The software created by BetSoft makes it possible that you do not have to download any software for you to play online casinos. Ride’m poker very similar to straight poker. It is also a multi-card game played in the same way. It is possible to play, one, two or three hands at a given time and this will significantly increase the odds you have to win. Typically, the dealer is only there, and you are playing against yourself in a game Let It Ride poker. The decision whether to let your bets ride or pass is solely yours. The dealer then turns the two cards that he holds over. The objective of the game is straightforward when playing free ride’m poker. You aim to see whether the cards that the dealer has will be a winning hand. There is an optional side bet bonus which pays up to twenty thousand dollars in cash. It is advisable however before playing for money to enjoy the test mode. This strategy will increase you knowledge and give you an advantage over the other players. It is critical for you to know how to play Ride’m poker before you start playing on the money train. To help with that, here is a review that will enable you to be better equipped. 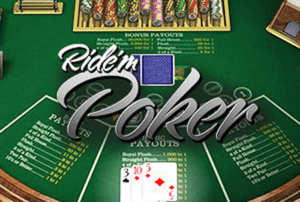 Like most poker games, play Ride’m poker using the traditional 52 card deck. You are required to use the chip denominations on the lower right screen to set bets. To do this, click and drag into the hands you want to play. Every hand you have is dealt three cards from the dealer and two community cards which are put face down in front of the dealer. Look at your card and then decide if you want to pass and take one of the three bets back. Alternatively, you can ride the cards and leave them in play. The dealer then turns one of the two community cards over. You can again choose whether you’d like to pass or ride. You can also place another bet. After you’ve decided, the second community card is flipped, and you get paid depending on the pay table rates. The minimum bet is as low as 3.00 for all the available three hands. The maximum wager is 33.00 for all the hands. The optional bonus side bet is 1.00. • For a hand with 10s or better, they payout is 1:1. • For a two pair hand, the payout is 3:1. • Three of a kind pays 3:1. • A straight pays 5:1. • Flush hand pays 8:1. • The full house pays 11:1. • Straight flush pays 200:1. • Royal flush pays 1000:1. • Three of a kind pays 5:1. • Four of a kind pays 400:1. • A straight flush pays 2,000:1. • A royal flush pays 20,000:1.